Good morning. I am pleased to be in Brooklyn to speak to you and meet with the leadership of New York City's most populous borough. In the aftermath of the financial crisis, as we wound down our emergency meetings, I asked my staff to develop an energetic outreach program so that I could visit the different parts of my district. Over time, I plan to visit all parts of the region. Each trip gives me a chance to deepen relationships with the people whom I represent. As you may know, the New York Fed's district includes New York State; twelve counties of northern New Jersey; Fairfield County, Connecticut; Puerto Rico; and the U.S. Virgin Islands. In May, I travelled through the mid-Hudson Valley to meet with community leaders, businesses, academics, bankers and elected officials in Poughkeepsie, Middletown, Fishkill and Newburgh. Even though these are large towns, Brooklyn—with over 2.5 million residents in 2010—has many more people than all four of them combined. Brooklyn is important to me not just because it is an important part of the New York Fed's district, but also because I have lots of personal attachments. My grandfather served as the minister of a church on Flatbush Avenue, so my father was raised in Brooklyn. As an adult, I lived in Brooklyn myself for six years. We moved out to the suburbs only so that my wife—who is an only child—and I could be helpful to her parents. Of course, we're meeting here today not only because of my personal ties. Today I will meet with a wide range of people to talk about what I do. I will also hear firsthand about the economic and financial issues important to you in Brooklyn. These conversations help me to represent all my constituents in my work at the Fed. I also look forward to visiting the Navy Yard and meeting with Caribbean American Chamber of Commerce and Industry, and several new businesses. 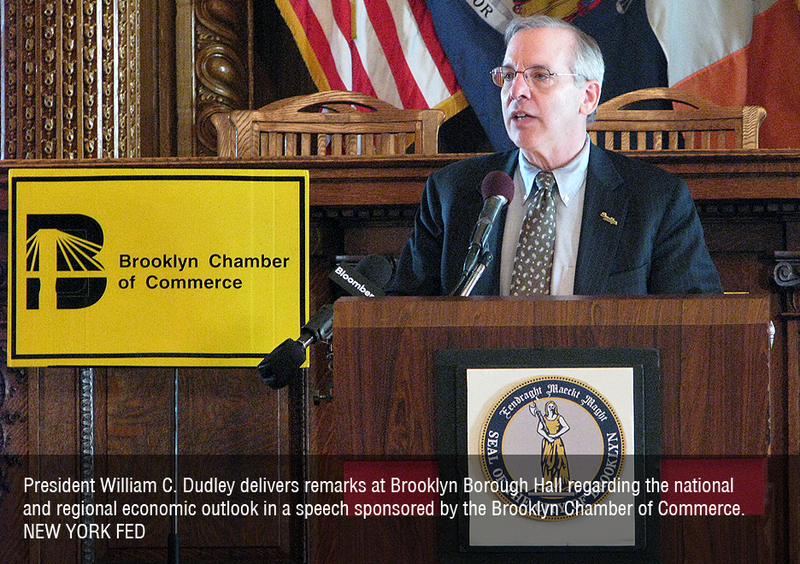 I thank the Chamber for inviting me to speak here in Brooklyn. This morning I will talk about economic conditions in the nation and the region, paying particular attention to how the recession has affected the labor market here. Looking at jobs, Brooklyn's employers have weathered the recession better than those in many parts of the region and country. However, the unemployment rate remains too high, as does the level of stress among some homeowners here. By way of introduction, let me start by summarizing what the New York Fed is, what we do, and what makes my job so interesting. The New York Fed is part of the Federal Reserve System, America's central bank, which was created by Congress in 1913 to manage the supply of money in the economy. The Fed System is comprised of the Board of Governors in Washington, D.C.—a federal agency currently led by Chairman Ben Bernanke—plus 12 regional Reserve Banks that span the country. The New York Fed is one of these Reserve Banks. Congress has set an objective for us: To pursue the highest level of employment consistent with price stability. This goal is often referred to as our "dual mandate," because it combines two parts: high employment, and low, stable inflation. In order to promote this objective, we also pay close attention to financial stability, because without financial stability, it is very hard to achieve our goals for jobs and inflation. What do the terms stable inflation and financial stability mean? By stable inflation we mean keeping the rate of inflation low and fairly steady over the months. By financial stability, we mean ensuring that financial institutions have sufficient capital and are managed responsibly, so that we need not worry that the failure of one large firm will trigger a cascade of other firm failures with more job losses. The Federal Open Market Committee, which consists of the Board of Governors plus the presidents of each of the 12 district Banks, decides how to best achieve the objective set by Congress. We meet in Washington, D.C., eight times per year to vote on whether to change some key interest rates and, if so, by how much. As the current New York Fed president, I am vice chairman of the FOMC. At these meetings, each committee member presents his or her current outlook for the economy. For these assessments, we augment input from our research departments with critical information about local economic conditions supplied by our boards of directors, regional advisory councils and conversations with local stakeholders. My visit to Brooklyn today is a part of these regional activities, in which I learn first-hand about the economic and financial conditions important to you. One thing that makes my job even more interesting is that New York has some roles unique within the Fed. For example, the New York Fed is the Reserve Bank charged with implementing monetary policy. This means that at the direction of the FOMC, we buy and sell Treasury securities in order to change short-term interest rates. We are also the eyes and ears of the Fed on Wall Street, and we supervise many of the largest financial institutions in the country. We operate Fedwire® the conduit for large money transfers between banks. In addition, we provide banking services to the U.S. Treasury, and central banks and governments from around the world. At the regional level, we continually track economic conditions in our District with the help of a number of tools that we have created for this purpose. For example, to fill a void in current measures of economic output, my staff produces monthly economic indicators that are similar in concept to gross domestic product (or GDP) measures for New York State and New York City. We also have initiated a consumer credit panel so that we can monitor local household credit conditions. Furthermore, we have a new quarterly survey to track credit and financing issues for small businesses, which create a lot of jobs. Before I go further, I want to thank the Brooklyn Chamber of Commerce, the Myrtle Avenue Revitalization Program, the Fulton Business Improvement District and Kings County Hispanic Chamber of Commerce and other members of Brooklyn's vibrant business community, who assisted us with this survey. More than 80 businesses responded from Brooklyn. The survey results will be published early this summer and, of course, we will share the results with you and post them on our website. If you are not already part of the survey, I invite you to give your business card to my staff. We will add you to our survey universe, so that it can reflect your views, too. Finally, and crucially, in the aftermath of the financial crisis, we are working with our colleagues in Washington and at other agencies in the United States and abroad to help put the nation's financial system on a firmer footing. As regulators, we have made progress, for instance, in crafting tougher capital rules for the biggest banks. Yet, much remains to be done and we are determined to keep at it. I recognize fully that there can be no return to pre-crisis business as usual—whether on the part of the financial sector or on the part of regulators like ourselves. We must learn from the economic catastrophe of the past few years so that the financial system is able to perform its essential role in supporting economic activity without being a source of instability for the economy as a whole. Now, what are the outlook and risks for economic activity, employment and inflation in the nation? Since the recession ended in 2009, the economy has grown at a modest pace. Real GDP—that's the economic output of the country—increased 2.8 percent between the fourth quarter of 2009 and the fourth quarter of 2010. This growth was sufficient to lead to a modest one-half percentage point decline in the unemployment rate over the course of 2010. However, economic growth so far this year has been disappointing. Real GDP in the first quarter of 2011 grew at a tepid 1.8 percent annual rate, and the available data suggest that growth in the current quarter will not be much better. A major factor behind this slowdown is that real consumption growth (that is, spending on goods and services adjusted for price increases) has been slower than in the last quarter of 2010. This occurred, in part, because higher gasoline and food prices reduced the income that households could spend on other purchases. High energy prices also contributed to lower consumer confidence, which may have had an independent negative effect on consumer spending. As noted, a number of economic indicators suggest that economic growth in the second quarter will also be subpar. Manufacturing production fell in April. Most business survey indicators, including the New York Fed's own Empire State Manufacturing Survey, also have declined recently, although most continue to signal some growth. The housing market remains very weak and home prices fell in early 2011. After a notable improvement earlier in the year, the labor market showed more softness recently: more workers filed for unemployment insurance in the past few weeks, firms added fewer jobs on net in May, and unemployment inched up in April and May. In part, this softness is related to factors that I expect will prove transitory. These factors include the rapid rise in gas and food prices that I noted earlier, supply disruptions associated with the earthquake in Japan, and severe weather and flooding in parts of the United States. All three suggest that the soft patch may not persist. However, we continue to monitor the data for signs of more persistent weakness, whether related to the interaction of housing and consumption or some other factor. Financial conditions have improved, albeit gradually, which makes it easier for larger, well-established firms to borrow and invest. However, new startups and smaller businesses continue to find credit difficult to access. With stock market prices higher than a year ago and household debt lower, household balance sheets are in better shape, which should support household spending. Demand abroad—particularly in Asia—still appears robust, supporting our exports. Most importantly, and notwithstanding the May jobs report, the labor market appears more solid than it was a year ago. Private firms added jobs at a faster pace over the last five months than they did last year. This growth has been strong enough to more than offset government layoffs. Unemployment is also noticeably lower than it was in November, after a decline that was rapid by historical standards. Consequently, I anticipate that economic growth will pick up enough in the second half of 2011 to sustain a moderate economic recovery. Still, the pace of recovery probably will be painfully slow for the many unemployed and underemployed workers. Even if the economy added 300,000 jobs per month over the next year and a half, we would likely still have considerable labor market slack at the end of 2012. As I mentioned earlier, high oil and commodity prices have further strained many families that already had tight budgets. The recent slowing of consumer spending growth could prompt businesses to limit hiring and investment. Finally, aggressive near-term government spending cuts or tax increases could slow economic growth at least in the short- to medium-term. I would emphasize, however, that a credible plan for long-term fiscal consolidation is sorely required and would have many economic benefits. Although these issues bear watching, I still believe that they remain risks rather than the most likely outcomes. With respect to inflation, after a period when inflation was lower than the Fed would like to see, headline inflation (on a yearly basis) has risen somewhat above desired levels. The recent rise in commodity prices is likely to push up headline inflation further in coming months. It is noteworthy, however, that the spike in oil and food prices over the past year has not spilled over much to the prices of other goods and services. Furthermore, commodity prices have dipped in the recent weeks. Thus, most measures of underlying inflation trends—including core inflation (which excludes volatile food and energy prices)—remain below levels consistent with our mandate for price stability. Going forward, futures markets do not signal that investors expect commodity prices to rise rapidly from current levels. Provided these prices stop rising rapidly (or indeed retreat further), I would expect headline inflation to decline to a level closer to our longer-run objectives. While this process plays out, however, it is critical that we ensure that inflation expectations do not become unmoored. It is much harder to keep inflation in check if people begin to raise their expectations of inflation. At this point, measures of inflation expectations overall remain well within the range of recent years—and some measures have moved down significantly in recent weeks. Economists at the New York Fed have examined inflation expectations using a unique survey that we sponsor. As reported in a recent post on our new Liberty Street Economics blog, they find no evidence to suggest that a wage-price inflation spiral is getting underway. However, we continue to monitor expectations for medium-term inflation very closely. To sum up, despite the recent soft patch, economic conditions have improved in the past year. I expect a moderate recovery to continue. However, we still have a considerable way to go to meet the Fed's dual mandate of full employment and price stability. So, how is our region doing? As I mentioned a moment ago, the New York Fed produces economic indicators to help monitor the performance of the region. Based on these measures, the downturn in economic activity in New York City ended in November of 2009. Since then, New York City's economy has been on the mend, and our numbers for April show that the recovery continues at a healthy clip. Let me turn specifically to employment trends in the region. In particular, I want to describe our region's experience during the recession and recovery. To put this in context, it's important to relate our region's downturn to the nation's experience. Nationally, the Great Recession, which began in December 2007, has been the deepest economic downturn since World War II. When employment finally bottomed out in February 2010—seven months after the official end of the recession—the country had lost almost 9 million jobs—a 6 percent drop—and the unemployment rate had more than doubled. In addition to the millions of people who lost their jobs, many more saw their hours or income cut, and the duration of unemployment for jobless workers reached a historical high. For many families, this distress was compounded by losses of wealth from declining home prices. Since that low point of employment, job creation has resumed, albeit at a slower pace than we would like, and unemployment has fallen by about a percentage point. As in other parts of the country, employment in our region declined substantially during the recession. However, employment in New York City and across much of New York State declined less severely than the nation. Both the state and city lost less than 4 percent of their jobs. Part of the reason for the more moderate decline in jobs in New York during the recession was a less pronounced boom-bust housing cycle. Indeed, as a percentage, the city lost fewer jobs during this recession than it did during either of the last two downturns. Now, as in the nation, a labor market recovery has begun across much of the region. Over the past year, New York State has added roughly 100,000 private-sector jobs. Within the state, the recovery has been somewhat uneven. New York City has been gaining jobs for more than a year now—at roughly the same pace as the nation—and it has recovered about half of the jobs lost during the downturn. Continuing to drill down geographically, let me talk in more detail about conditions here in Brooklyn—recognizing that Brooklyn is a big city and conditions vary neighborhood by neighborhood. As you know, if Brooklyn were a city it would rank as the fourth largest in the nation. The borough's population is also amazingly diverse. Over 36 percent of those currently residing in the borough were born abroad—and that doesn't even include second generation immigrants. Significant numbers of residents of the borough were born in the Caribbean Islands, China, Mexico, Ukraine and Russia. Brooklyn has a vibrant business community: almost a half-million jobs are located in the borough. Almost two out of every five jobs are found in the health care and social assistance sector, and these jobs represent a wide range of providers including hospitals, outpatient centers, visiting nurses and child care employees. The borough is also home to jobs in a diverse set of other industries, including apparel manufacturing, retail trade, and professional services, not to mention a number of public and private colleges. Where do Brooklyn residents work? Many Brooklynites work in businesses within the borough, in the sectors that I just mentioned. However, the majority commute to work, primarily in Manhattan (as I did when I lived here), but also in other boroughs. Thus, the improving job markets in the city and the region will also help Brooklyn residents. Now, how did the borough fare during the recent downturn and how is the recovery proceeding? I will answer this by looking at jobs and at housing and credit conditions. With regard to jobs, the news is mixed. On the positive side, Brooklyn employers held their own during the 2008-09 downturn and have bounced back well. From peak to trough, the number of jobs located in Brooklyn shrank by 1 percent, which was not nearly as steep as in New York City as a whole, and much less severe than the national average. The recovery in jobs in Brooklyn is proceeding at a healthy pace. By early 2010, employment in Brooklyn had recouped all its losses and was setting new highs. Encouragingly, job growth was brisk through the third quarter of 2010—the latest date for which we have hard figures. By then, overall employment was up by 5 percent from its low point in early 2009. This jobs recovery is being led by an ongoing expansion in healthcare, which was little affected by the downturn, as well as sizeable gains in the leisure and hospitality, retail, and professional and business services sectors. On the negative side, unemployment for those who live in Brooklyn remains very high. The seeming disconnect between the healthy jobs picture that I just described and the high rate of joblessness is largely explained by the majority of Brooklynites who commute to work. The severe layoffs in Manhattan and other boroughs during the downturn cost many Brooklyn residents their jobs. Thus, joblessness among residents of Brooklyn is still running a little over 9 percent—above the citywide average and slightly above the national rate. As in much of the region and the nation, jobless rates have retreated somewhat but still remain stubbornly high. Also, there is plenty of room for improvement when one focuses on the situation of Brooklyn households. In 2010, almost a fifth of families in Brooklyn had incomes below the poverty level, about twice as high as the national rate. In addition, many self-employed workers in areas such as real estate sustained big hits to their income during the downturn. Like the nation, Brooklyn experienced a housing price boom and bust. However, Brooklyn is showing signs of quicker recovery than the nation. From 2000 to 2007, average home prices in the borough increased about 2½ times, compared with a doubling in prices at the national level. During the housing bust, prices here fell steeply—by 15 percent—but not as much as the 25 percent national drop. Since then, however, local home prices have begun to recover, even as they have fallen to new lows nationally. Nevertheless, as of March of this year, 12 percent of Brooklyn's homeowners are seriously delinquent on their mortgages. That is high compared with the 8 percent national rate. Of course, unlike much of the nation, most Brooklynites rent their homes, rather than own them. This tendency to rent may be one reason that Brooklyn's economy—like New York City's more generally—was not hit quite as hard by the housing downturn and ensuing recession. Yet, many renters, like owners, are still experiencing financial stress from job and income losses. More broadly, how are Brooklyn's families doing in restoring their finances? During the recession, all across the nation, debt delinquencies soared and many families found that they needed to reduce their debt to a sustainable level. We keep track of the credit conditions in the region—including the average debt that people carry and whether they are current with their payments—using the Federal Reserve Bank of New York's Consumer Credit Panel. In Brooklyn, although delinquencies remain very high, debt levels and delinquencies continue to fall. The amount of debt carried per person with a credit report in the borough is now down by 8 percent from its peak level in late 2008, and is lower than average for New York State. As of the first quarter of this year, debt per person was continuing to fall modestly. Nevertheless, the mortgage crisis has taken a heavy toll on Brooklyn's homeowners. In terms of consumer debt, seriously delinquent debt (including mortgages) quadrupled from 2005 to 2009, reaching nearly double the statewide rate. As of the first quarter of 2011, this delinquency rate has declined modestly. Yet, delinquencies in Brooklyn remain far higher than the rate in the rest of New York State and the nation. These patterns suggest that Brooklyn's households have made some progress on restoring their balance sheets to health, but still are likely to have a considerable ways to go before they complete the process. Thus, Brooklyn was affected by the recession, but less so than the nation and even somewhat less so than other parts of the city. With prospects for the national economy improving, the outlook for Brooklyn's diverse economy and labor force, and New York City's as a whole is brightening as well. Nevertheless, while a jobs recovery appears underway, unemployment and poverty remain high and signs of stress clearly remain in household finance. In the near-term, the regional economy, and indeed the economy of the entire state, faces a number of challenges. Among them is the need to address the large state budget gap. New York is not alone in having seen its tax revenue decline as the economy weakened and, thus, faces hard choices. As I mentioned, state and local government employment has already weakened in many areas. Going forward, further contraction in this sector continues to pose some risks to the recovery. Despite these issues, in our recent survey, nearly 40 percent of Brooklyn small businesses reported an increase in their sales during the first quarter of 2011. In addition, when asked about their business outlook, over two-thirds of Brooklyn respondents responded positively, saying that the outlook for their business was fair to very good. In fact, small businesses in Brooklyn were the most optimistic among the five boroughs of New York City. Longer term, one of the key challenges for this region is to ensure that it trains and attracts a highly skilled workforce that can meet the needs of innovative and rapidly changing firms. A region's human capital—that is, the skills and education of its work force—determines a large part of its economic success and resiliency. The education and research taking place in local colleges and universities, such as Brooklyn College and the Polytechnic Institute of New York, directly helps to build those skills and to sustain economic growth. To sum up, the national economy experienced a soft patch in activity during the first quarter of 2011 that has spilled over into the beginning of the second quarter. Nevertheless, the recovery in much of the region continued at a good pace. It is very encouraging that Brooklyn's employers have already added back enough jobs to replace all those lost during the recession, and then some. The continued expansion of employment across the nation should also support economic activity and jobs in Brooklyn. Yet the regional recovery is still far complete. Brooklyn's households continue to have relatively high delinquency rates on their mortgage and other debt, suggesting continued stress for many of its residents. Furthermore, despite recent improvements, both nationally and in Brooklyn, unemployment remains unacceptably high.